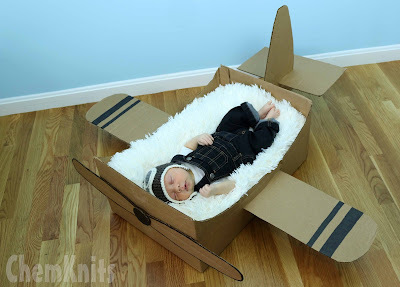 When I crocheted the baby aviator hat, I loved the way the Repeat Crafter Me designer photographed the hat on a 6 month old baby in an airplane box - and she shared the pattern to the box plane, too! 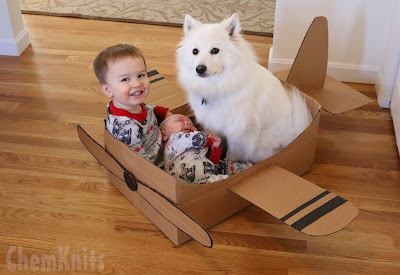 This was so cute that I knew that I wanted to make the box as soon as possible for my boys to play with. I LOVE the Repeat Crafter Me blog. The designer has fantastic crochet hats and I was thrilled to not only make the aviator hat but the cardboard airplane that was used as a photography prop. At the end of February, while both boys were napping, Keith and I thought that this would be a fun project to do together. Keith was on board (cardboard, haha) to be a part of this project. We wanted to make a plain big enough to photograph Ryder in the hat while sleeping and for Lucas to play in. The box we selected is huge, big enough for both boys at around 16" x 26" (measured by Keith's hand and feet) and around a foot deep. The main reason for selecting this box is that it had good proportions and was plain on the outside. It is hard to cut a curve in cardboard without bending it. Scoring it along the curve with a scissor edge made it MUCH easier to cut around. We traced the second curve the wrong way to have symmetrical swoops, but it turns out that the piece I cut out was symmetrical. YAY! I trusted Keith to draw the curves, he has a good graphic eye and is much better at free hand stuff than I am. The first wing was MUCH too long, so we needed to cut it down. I used a sharpie to create markings similar to the ones in the original post. 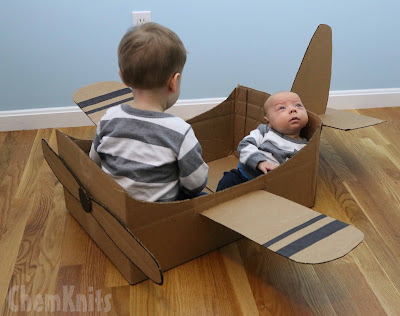 Eventually I plan to let Lucas and Keith go to town decorating the plane, but I wanted it to be simple for some initial photography. Can you believe that this box plane is made out of only packing tape and a single cardboard box? The wings are still removable but the tail and propeller are pretty secure. Lucky hasn't broken this box and it has been accessible to him for months now. Rowdy's picture of the day on Leap Day was him dressed up in the box plane. How cute is he? 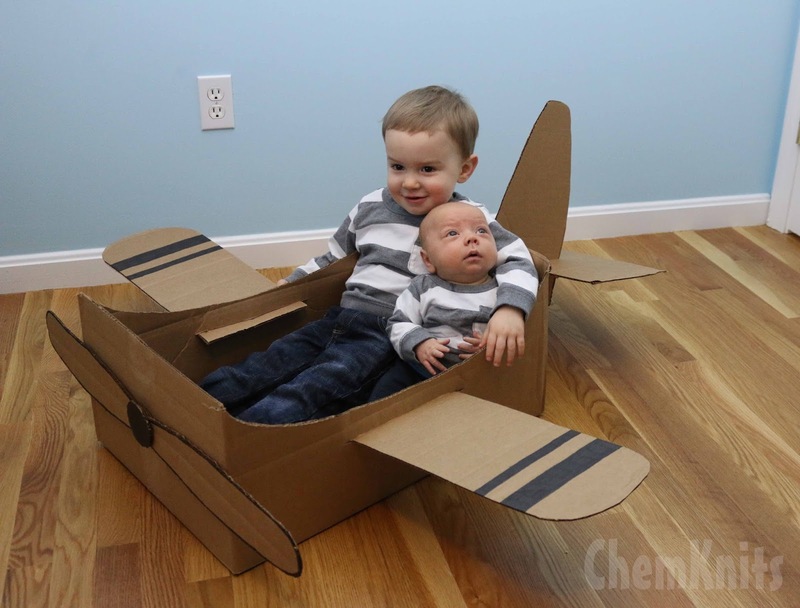 Shortly there after I put both boys in the box plane for the first time. Lucky loves getting a chance to snuggle his brother and back when Rowdy was so tiny he needed some extra support. 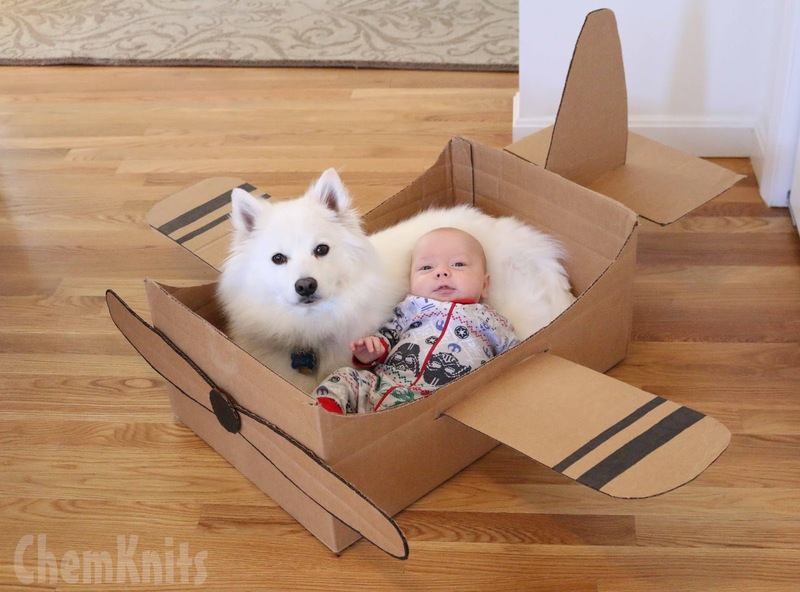 Snuggle time inside a box was perfect to keep them both safe. Indy is such a trooper! He is happy to snuggle with his boys, too. This box is turning into quite the photography prop in addition to being great for imaginary play. Do you have any suggestions for other box related crafts we should try?